1) It was a counter to Delinquent Duo, as well as a soft counter against hand disruption cards like Don Zaloog and Drop Off. Hand disruption did not have a reliable counter at all. 2) It enabled tribute monsters to be summoned more easily. 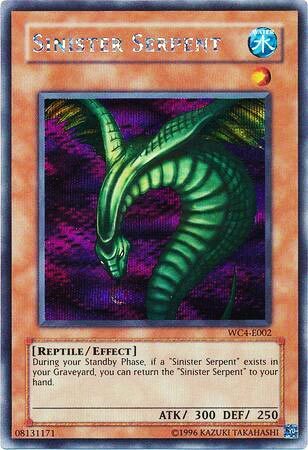 In Yugioh, tributing a monster was an inherently difficult cost resulting in monsters just being Special Summoned anyway. If you could keep a monster with awful stats and no on-field effect alive, it’s not unreasonable to say you deserve to tribute it. 3) Both players were able to use it and players were able to decide whether to use it for hand advantage or continuous field presence. Compared to other monsters, there were more ways to use it strategically. 4) Cards with discard costs were largely underpowered. Yugioh lacked the nuanced cost system of games like Magic, and as a result, discards were used as resource costs. But it’s an inherently illogical proposition to sacrifice a card and another card in order to resolve the effect of 1 card. Whichever card you discard is the opportunity cost of the card you activated, and assuming that all 40 cards in your deck are of similar importance, the cost makes it a wash. With Sinister, at least discard cards were viable. There still was a limit on how many discard costs cards a player would want to run (because what if Sinister is not drawn and you end up drawing just the discard cards). However, at least they were playable with Sinister around. 5) I feel like Sinister was helpful to players at a disadvantage, particularly by offering more survivability. If a player drew a bad hand, they could use Sinister as a cushion, alongside some smart spell/trap plays to keep themselves alive. If a player is being Yata-locked or swarmed, and they’re running low on resources in general, at least they have some monster to set.